I've been plugging away at the first 'block' of Mrs Billings coverlet. There was quite a bit of 'unsewing' at crucial times, but eventually I got it together. 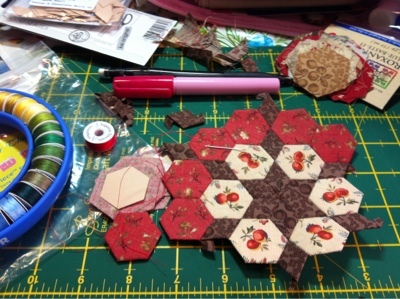 Now I'm not sure what to work on next, perhaps I'll prepare some more hexagons? 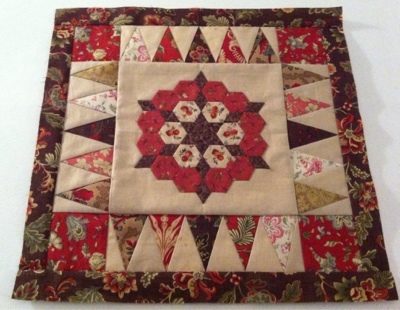 While at Road to California we were lucky enough to take a mystery class with Tracey Brookshier. 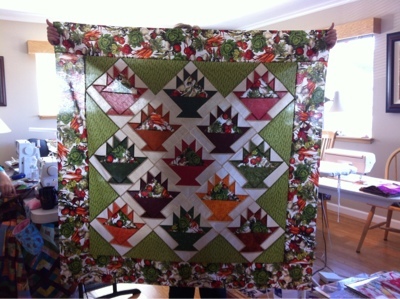 I got my basket blocks almost complete at the class - and I thought it would be fun to complete the top yesterday. 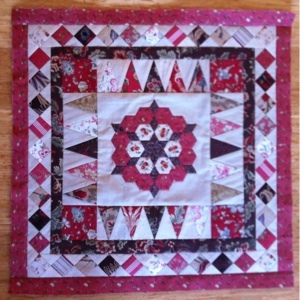 I purchased the fabrics as a kit from the tutor - its really quite fun isn't it? 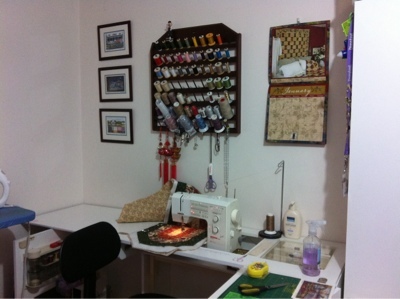 Here is where I'm up to after a fun day of sewing at the retreat. I'm so thrilled with how this project is looking so far! I got a few hexagons made on the plane, but now that we're at Linda's beach house on retreat, I'm progressing in earnest. 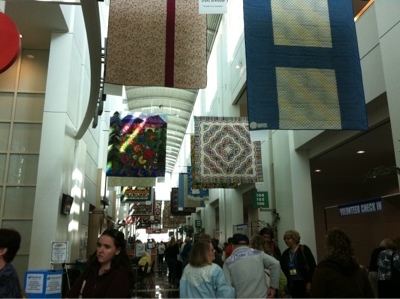 Had a great time at the quilt show, and I'll share more later. 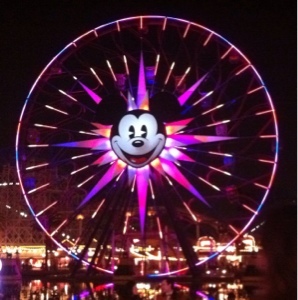 Yesterday my friends and I spent the day at California Adventure, and today we were at Disneyland, it really is the happiest place on earth!! The entrance hall has some beautiful quilts hanging. 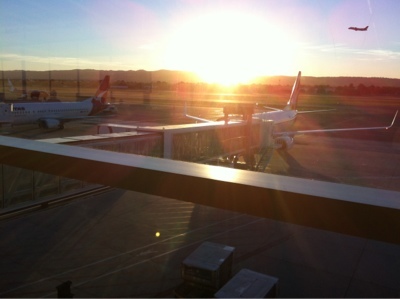 We're heading in for day two - can my pocketbook take it?? So many lovely purchases already. 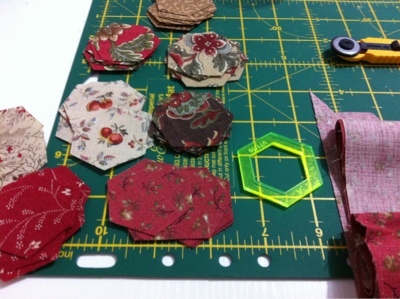 I'm cutting tiny hexies for my Mrs Billings project. These ones are 5/8" finished! So, what has been happening here recently? Well ... in the days after Christmas, there was seismic activity in my dining room ... resulting in the demise of the gingerbread house ... and it was delicious! I hope to finish the piecing on these tonight ... it's on the list! Not too hard to accomplish for today - and I'm almost done. Emptying the 'blue container' is a HUGE accomplishment. 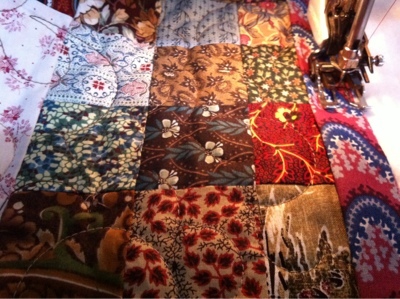 It is the scrap fabric that has been languishing in the corner of the sewing room for YEARS. I donated a whole lot of it recently, I've sorted it today and put away the useful fabric, and tossed the rest. What a huge relief!